Print your logo onto these custom printed eco pen and notebook sets or one of our other innovative conference items and use them in your next marketing campaign as a unique giveaway item. Are you looking for eco friendly items for your next marketing campaign? These recycled memo books are perfectly made to support our environment and to leave a statement in your office as well as conferences, schools and/or universities! An extra heavy duty cardboard cover made from recycled paper protects 75 pages of recycled blank paper and can have your Brand on it! Furthermore, these customized note pads come also with colored adhesive note pads, blank black ink pen made from recycled paper and a metal ring binding. 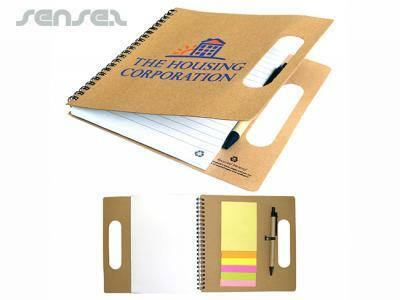 A5 lined notepad with extra handle, and post it notes is perfect for any office. This quick turnaround promotional item can be produced within 4 days - rush fee of $0.60 per unit applies or within 2 days for extra AU$1.00 per unit. Other innovative corporate gift ideas that could be suitable to create brand awareness include these cheap promotional Soulus Notepads With Pen, quirky advertising gifts such as these Eco Cambridge Cork Notebooks A5 or how about using one of our more bespoke custom made products such as these great quality Coloured Pocket Notebooks With Pen A7? Custom brand these spring water bottles 600ml or one of our best-selling promotional conference items with your company logo! Your promotional eco pen and notebook sets can be silk screen printed in 1 or more colours. Costs shown include a 1 colour logo print on your custom branded eco pen and notebook sets. We can print more than 1 colour, however it incurs extra costs. We can achieve a perfect PMS colour match for the print. Personalise your eco pen and notebook sets or custom design conference items for your marketing campaign. How can these unique promotional eco pen and notebook sets or our personalised conference items fit in with your marketing strategy and help you maximise your brand exposure? Our custom made Eco Pen and Notebook Sets can be produced from a minimum quantity of 100 pieces. We can have your logo branded on these corporate Eco Pen and Notebook Sets in 1 Colour Silkscreen Print or 1 Colour Pad Print. A setup fee of AU$180.00 will apply to make the film.